I have always been inspired by the consulting firm, McKinsey & Company, since my son, David, worked for them out of college. I was impressed that the whole company took a day off just to review it’s values!! Interestingly enough, McKinsey is known as a CEO Factory, as many of its consultants end up running large companies. 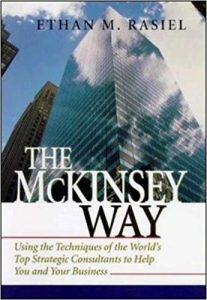 I would like to share some insights into the McKinsey Intention of their Brand through a book review by Ethan Rasiel. Since McKinsey likes to come up with an Initial Hypothesis during their first visit on a consulting project, here is what I would refer to as a Business Intention for the company they use for each project that is value-based and consistent. *Understanding the ‘right’ problem is the key. *Don’t reinvent the wheel. Every problem will be similar to another; but at the same time unique. I personally love these value-based Intentions for McKinsey.